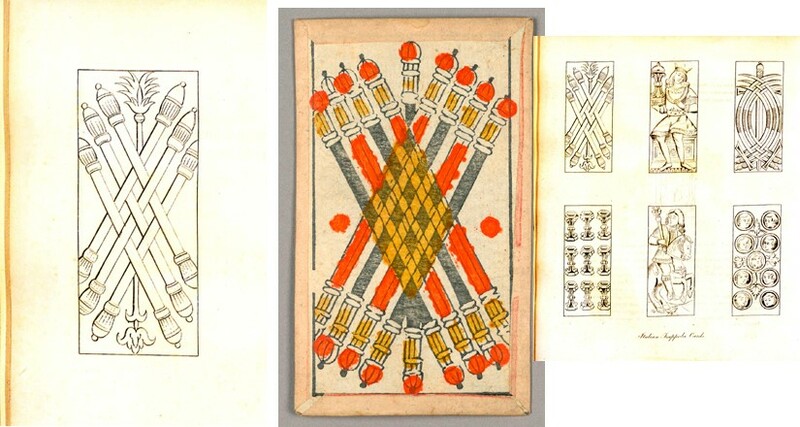 The first section of the book discusses the origins and history of playing cards – the games, and the images printed on the cards have a complicated global history. Card games and cards originated in the East and chess migrated from India to the Arabic lands. Over centuries, the religious wars of the Crusades between East and West over the Holy Land propelled a great interchange of culture, art and trading. The Spanish were probably introduced to playing cards by their Moorish invaders, with cards then spreading to Italy through Sicily and Calabria, France and then Northern Europe. Cards were known in England after the Second Crusade, at the end of the 13th century. The continued Arabic presence among the Italian, Spanish and French people allowed Europeans to become acquainted with Arabic literatures, art, customs, and amusements- including card games. 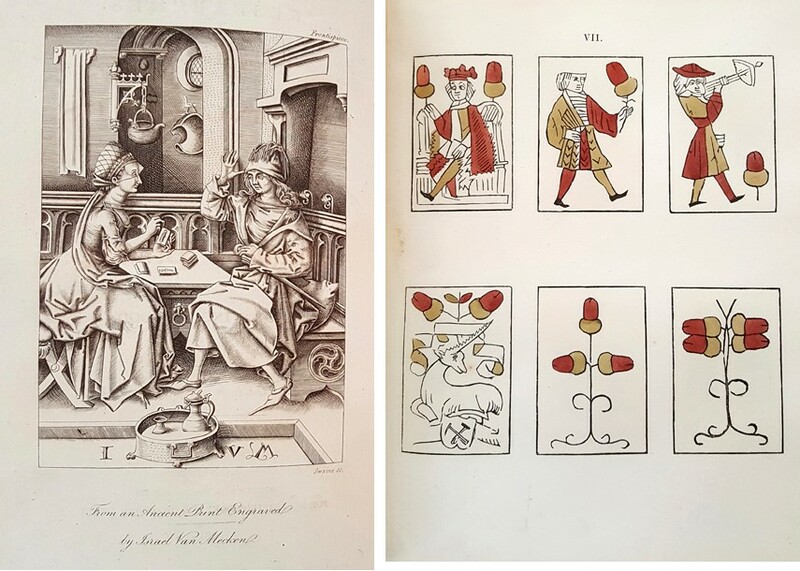 The second section of the book is about graphic and typographic arts; playing card designs typically consisted of woodcuts or engravings that represented figures and emblems of military origins. Military origins also explains the striking analogies between early card games and chess. They both represent combat or war, using ranked royalty and military figures- Kings, Knights, Knaves and common soldiers. The first card game known to the Italians (and probably obtained from the Arabs), was Trappola, which has 36 cards. These cards had four suits: swords (spades), cups or chalices, denari (money) and bastoni (clubs or sticks), as well picture cards. The Cooper Hewitt Museum has in its collection some of these trappola cards, similar to the cards in Singer’s book. L: (Detail) Chalices suit of Italian Trappola playing cards. p.198. 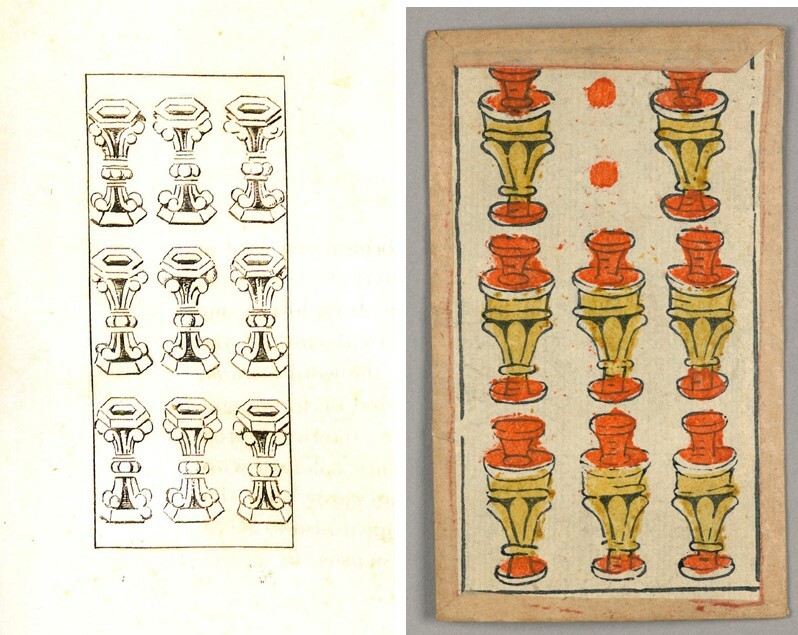 Researches into the history of playing cards; with illustrations of the origin of printing and engraving on wood … R: Minchiate Game (Tarot)” Playing Card (Italy), 17th-19th centuries; Woodblock print with stencil color; Number 1909-22-4-8. Drawings, Prints, and Graphic Design department. Early versions of chess and cards were adopted by many countries, who in turn altered the games to create their own national versions. The author asserts that cards derived from the “Egyptians”, or Gipsies, when they disbursed throughout Europe, became the basis of fortune telling. Tarocco Siciliano was a tarot deck of cards developed during the Renaissance and still used today. In 1680 the Compleat Gamester, a book about games and gaming, claimed that whist was so commonly known in England at the time that “every child of almost eight years old hath a competent knowledge in that recreation”. Whist is a game with origins dating back to the 16th century, and since then has seen many derivations — popular games like Spades and Hearts (other trick-taking games) are all progeny of this first, and simplest, form. Card games are popular all over the world – children’s games, games that both children and adults can play together, and of course, those adult games that are favorites for gambling, like poker. All have their own fascinating history. You can help support research of this and other topics through the Libraries’ Adopt-A-Book Program.